Iowa is a relatively ok state for poker players. They have options, at least. For example, poker players can participate in home games and in card games that are ran in licensed and regulated casinos. However, the legality of online poker isn’t clear, which more than likely makes it illegal. This is in despite of the fact that online poker sites still accept real money players from Iowa. Well, that’s the cliff notes for the poker laws in Iowa. However, if you want to read about these laws in more detail, I encourage you to read what we’ve written up below. Iowa doesn’t have any state laws that mention online poker. However, that usually means that, as a default, the general statutes are used. If that is the case than online poker could be considered illegal within the state. Social poker games appear to be legal under Iowa’s laws, but there are some funny restrictions. For example, to play in a social game, you must have a prior relationship with everyone involved. What that means, to what extent and how it could ever be enforced is anyone’s guess. Then there’s the standard law that no one can profit from the running of the game, which includes rake, door or food fees. Players cannot lose more than $50 in the game either, and must have the opportunity to deal (or run) the game, if they so choose. In all seriousness, that pretty much sounds standard for any home game I’ve played in. So you shouldn’t have any problems. a. The gambling is incidental to a bona fide social relationship between all participants. e. No person receives or has any fixed or contingent right to receive, directly or indirectly, any profit, remuneration, or compensation from or as a result of the gambling, except any amount which the person may win as a participant on the same basis as the other participants. g. No participant wins or loses more than a total of fifty dollars or other consideration equivalent thereto in one or more games or activities permitted by this section at any time during any period of twenty-four consecutive hours or over that entire period. h. No participant pays an entrance fee, cover charge, or other charge for the privilege of participating in gambling, or for the privilege of gaining access to the location in which gambling occurs. i. In any game requiring a dealer or operator, the participants must have the option to take their turn at dealing or operating the game in a regular order according to the standard rules of the game. a. Card and parlor games, including but not limited to poker, pinochle, pitch, gin rummy, bridge, euchre, hearts, cribbage, dominoes, checkers, chess, backgammon, pool, and darts. Do Casinos in Iowa Offer Poker? Yes. There are a number of commercial and tribal casinos within the state. Here is a list of casinos to get you started. We receive a lot of questions about the legality of online poker sites and gaming in Iowa. We thought that it would be helpful to post those questions and our answers here for everyone to benefit. 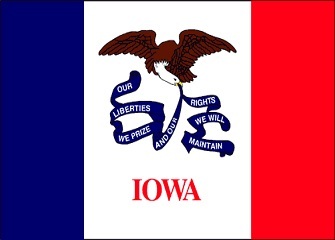 Will online poker be regulated in Iowa? A bill was proposed this year (2013) that would allow casinos in the state to run poker games online. However, the senate shut it down out of a lack of interest. As another poker portal said, it’s hard to know what to make of it in regards to future regulation. Does that mean the state’s just not interested (right now) or that there’s not enough support? What can you say about the bill being proposed in the first place? Someone must’ve been interested, right?! So we would leans towards, yes, we think that regulation is in Iowa’s future. When, we don’t know. Several years? A couple of months? Either way, they’re much further ahead compared to other states. Is there an online poker room that accepts players from Iowa? Yes. Iowa residents can sign up to any poker site that accepts US players. That list includes sites like Bovada, Sportsbetting Poker, Americas Cardroom, Sportsbetting.ag and BetOnline. What other forms of regulated gambling is offered in Iowa? Iowa offers para-mutual horse and dog racing in both live events and simulcasts from other states. Residents can also participate in charitable games including raffles, bingo and games, as well as the state lottery. Where can I read more about Iowa poker laws? Here are some interesting facts about gambling and poker in Iowa. Iowa regulated riverboat gambling in 1989, making it the first state to do so. At that time the maximum bet was $5 and players could not lose more than $200 in any given session. The betting restrictions were removed 3 years later. In 2004 the state made it so that casinos located on barges in man-made water basins or lakes were ok, versus forcing riverboats to be out in the water (away from land) to be legal. Studies show that Iowa would only receive $3-$13 million per year if online gambling was legal within the state. Keith Miller, a Drake University professor, said that the low projections could complicate any efforts to pass online poker legislation in 2012. This was a far cry from the original projections of $30+ million.